During my career, I have served as the lead strategist for several tuition resets, either as a part of an institution’s strategic leadership team or as a consultant. Before implementing this strategy, the leadership must prepare a financial model, best overseen and reviewed by an experienced outside consultant. The consultant should support that the desired outcomes are probable and should be able to justify that market conditions are favorable if the institution decides to lower tuition. Goals are not data-informed and vetted internally first. In successful resets, the key is to develop messaging that keeps parents and students focused on net out-of-pocket costs and the institution’s value, so they are not turned off by a sticker price. I also strongly believe that my experiences with price resets have been successful because I have worked with leadership teams who appreciate the science of planning, the art of timing, and most important of all – that a tuition reset strategy is one factor in a bigger, coordinated strategy that complements the success of the reset beyond the initial year. The planning involved in an undergraduate-focused tuition reduction of full-time tuition can take as long as eighteen months. Usually, trustee support is needed to even consider this strategy, and to go forward on writing a White Paper Proposal for this option. The White Paper Proposal is a comprehensive plan. While some institutions develop this with internal resources, others work with a consultant. Consultants bring the benefit of experience. If possible, consultants should be retained throughout the entire reset process, helping the institution to avoid pitfalls. 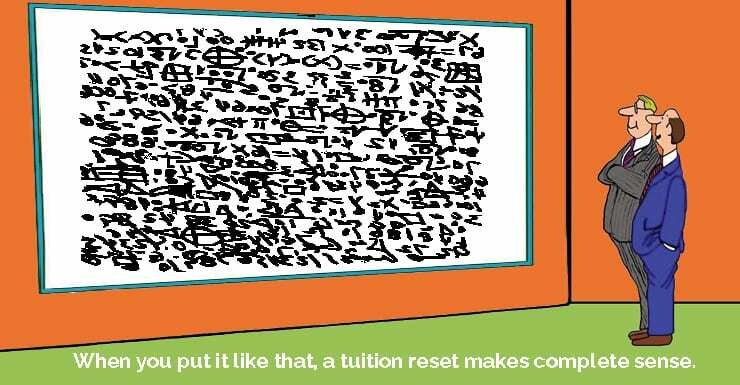 Resetting tuition is a high risk, high reward strategy and it is not applicable for all institutions. However, for the institutions who tackle it correctly and succeed, it offers many benefits.